Click the button below to add the Lexmark MX812dxme to your wish list. 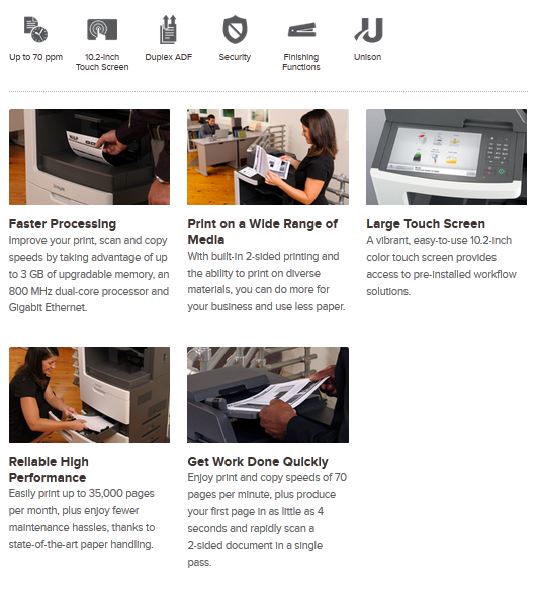 The Lexmark MX812dxme MFP with a customizable e-Task touch screen, 4-bin mailbox, 2,750-sheet standard input, 1GB standard memory and 320+GB hard disk provides print, copy, fax, scan and email functions. 54.1 x 26.1 x 28.9 in. 61.69 x 34.25 x 30.0 in. Print and copy speeds measured in accordance with ISO/IEC 24734 and ISO/IEC 24735 respectively (ESAT). 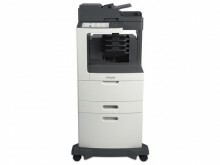 For more information see: www.lexmark.com/ISOspeeds.